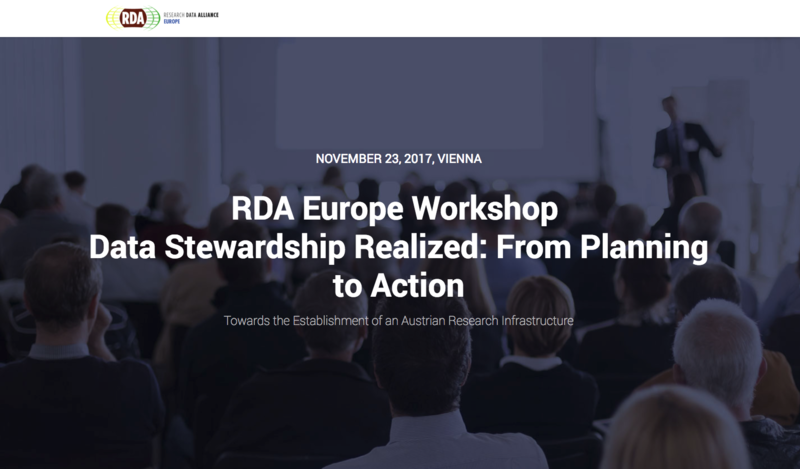 For the first time, RDA Europe will hold a one-day RDA Europe Workshop in Vienna on November 23rd 2017. The title of the event is "Data Stewardship Realized: From Planning to Action. Towards the Establishment of an Austrian Research Infrastructure". It is being realized through a collaboration between RDA Europe, the University of Vienna and the Vienna University of Technology. Against the backdrop of the European Open Science Cloud and other European data initiatives, the topics of FAIR data, data policies, data management plans and KPIs will be discussed by a mix of national and international experts. Take part in discussions covering the newly established EOSC, the development of national research infrastructure initiatives ("Use Case Austria") as well as international research infrastructures! To find more information about the event please visit this page.